Discount Heater Spring Away Pro Batting Net - Free Shipping! 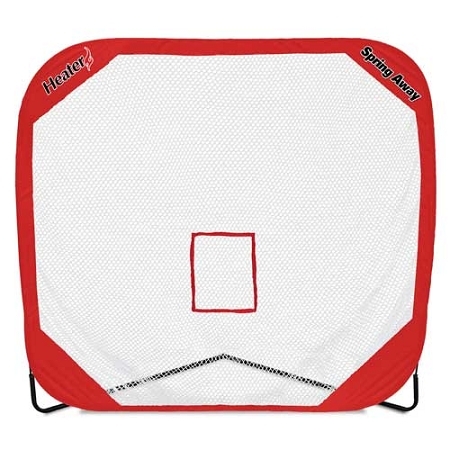 Heater Sports' 7 foot by 7 foot Spring Away Pro Batting Net is a great solo or two person hitting net. It can also be used as a throwing target, goal or even a backstop. Whether you are hitting baseballs, softballs, mini-balls or golf balls, this net is large enough to catch almost anything! It is a perfect solo baseball hitting net when used with a Springback Batting Tee or a Big League Pro Drop Toss Machine; the ball never goes more than a step or two away. It's also a great tool for personal one-on-one coaching in a limited space. Featuring an innovative steel spring net design, the Spring Away Pro Batting Net is flexible, yet extra durable. It's pop-up design makes it simple to set up and take down and its one inch poly netting makes it perfect for practicing your golf game, too. To ensure your satisfaction, your Heater Spring Away Pro Batting Net includes a 30 Day Money Back Guarantee. Spring Away Pro Batting Nets are also backed by a Full 1 Year Warranty. No matter where you order a Heater Spring Away Pro Batting Net from, NOBODY actually stocks them; they all ship directly from the manufacturer's warehouse located in St. George, Utah. Therefore, the shipping time frame is exactly the same no matter what website you order from (we hope that it is this one!). Spring Away Pro Batting Nets typically take 2-4 business days to ship from the time you place your order. They ship via Federal Express (FedEx) Ground and could take anywhere from a day or two to a week to get to you AFTER being shipped, depending on your proximity to their warehouse. We will notify you of your tracking number the moment we receive it from the manufacturer's warehouse. Click here to download an easy to read, printable PDF of the Heater Spring Away Pro Batting Net Owner's Manual.